Alright guys and gals, sorry for going all Kerouac on yall but I had to migrate servers and had quite a battle getting it all up and running. Anywho, I’m back and ready to post. So let’s take a look at Audio Technica’s sessy new AT5040. Man minimalism is nice. They stripped the mic design down to the essentials and boy does it look good. The shock mount even has a nice modern design to it. So basically Audio Technica has put 4 identical diaphragms working in unity to give you the utmost clarity in audio. I’m not quite sure how that principle works but I always feel more is better. Lets see how much this thing is going to cost… OUCH… $3000.00. 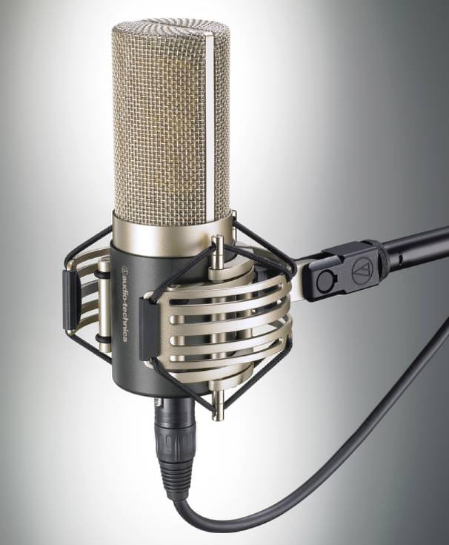 Let’s continue, heartbroken that this beautiful mic will never make it past my soon to be wife’s Chirstmas list for me. Audio-Technica, a leading innovator in transducer technology currently celebrating “50 Years of Passionate Listening,” is launching its flagship 50 Series of elite studio microphones with the AT5040 Cardioid Condenser Microphone. A-T’s ultimate studio vocal microphone, the hand-built AT5040 side-address condenser offers remarkably musical high-fidelity performance, with profound realism and depth, presence and purity of sound. Featuring a proprietary breakthrough element design, the AT5040 employs four ultra-thin (2 micron) rectangular diaphragms that function together providing combined surface area unachievable in a standard round diaphragm. Designed as a first-choice vocal microphone with smooth top end and controlled sibilance, the AT5040’s large-diaphragm characteristics and fast transient response also make it ideal for recording acoustic instruments such as piano, guitar, strings, and saxophone. The first of A-T’s design criteria for the AT5040 was purity of sound. To achieve this, A-T engineers developed a four-part rectangular element, the pinnacle of recent breakthroughs in sound-capture technology. Four exquisitely matched diaphragms function together (with outputs proprietarily summed) as a single high-performance element – effectively the largest element Audio-Technica has ever created. By using four diaphragms as a single capsule, the AT5040 achieves remarkably large surface area without the increased weight and decreased transient response that are the expected limitations of expansive size. Another key AT5040 design feature is advanced internal shock mounting that effectively decouples the capsule from the microphone body. For additional isolation, each AT5040 is also provided with Audio-Technica’s new AT8480 shock mount. Featuring a proprietary design, the AT8480 was engineered not only to isolate the microphone, but to rid the apparatus itself of any unwanted resonances and other audio aberrations that could be transmitted to the microphone. It also features a unique locking mechanism that holds the microphone securely in place. Every AT5040 is hand-assembled and inspected for 100% quality control and is housed in an elegant case of aluminum and brass with gray chrome plating for durability and low reflectivity. Discreet components have been selected for optimized capsule performance; in fact, every aspect of microphone has been carefully considered to minimize any effects on the audio signal. To protect the AT5040, each microphone comes in a custom-designed hard-shell carrying case, padded with die-cut foam compartments for the microphone and shock mount.